We love it when our guests fall in love with their hair in-salon, even more so when they use the best products as part of their home care maintenance plan. "Over the years I have tried many shampoos to try and maintain and brighten my hair colour. I have found that as a red head it fades very quickly after being coloured and none of the shampoos I have used before worked in prolonging the colour as I would have liked….until now!! 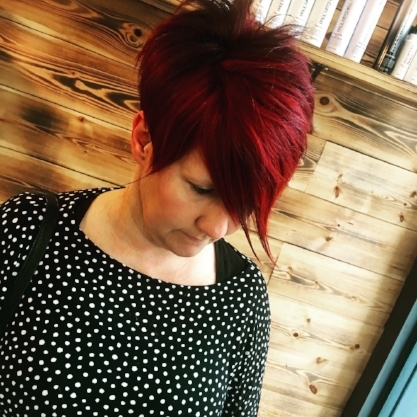 Josh at Reilly Denholm, the best in the business by the way, recommended Schwarzkopf Bonacure Color Freeze Vibrant Red Micellar Shampoo during my last visit." "I bought a bottle as a skeptic but it was reasonably priced so I thought I would give it a try. I have since used it a few times. Firstly the shampoo itself is bright red which can be a bit off-putting, however unlike others I have used, my bathroom does not look like a slaughter house afterwards! It has a lovely fresh smell and great texture too, making it feel like a luxury product." "Once I dried my hair I noticed the difference straight away. Not only was my hair lovely and soft and shiny, but the colour was extremely vibrant. The size of the bottle means it should last me ages and for the price I paid it works out at excellent value for money. I have since used it a couple of more times and my hair looks as good as the day I had it coloured. I am delighted that Josh recommended this to me as he knows what he is talking about that’s for sure. Thanks Josh and thanks Schwarzkopf for such a great product. I look forward to trying more from the range in the future." Speak to your stylist about the perfect BC Bonacure products for you to take home to maintain your hair colour in-between salon visits.